She livened-up the shoes with a knee-length multi-coloured patterned dress, which showed off her trim figure. 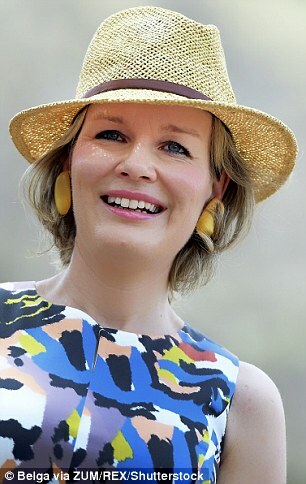 Careful to keep herself protected from the sun, Mathilde, 44, also wore a straw trilby hat, complete with a brown leather band. She finished the look with a statement pair of yellow earrings, drawing out the colours of her vibrant frock. Mathilde was on the final day of a four-day tour of the country in her role as the honourary president of Unicef Belgium. The royal looked fascinated as she toured the Buddhist temple complex, where the surviving structures date to the 11th and 13th centuries. She appeared pleased to be wearing practical shoes as she made her way back down the stairs from the temple with the help of a guide. On her way out from the temple Mathilde stopped to help motorists involved in a road accident, although little is known about the incident. The Queen also visited the Nongsay Primary School, in the district of Barchiang. There she spent time chatting with pupils and graciously received a school hat from a member of staff. Earlier this week, the Queen met the Minister for Foreign Affairs, the Minister for Female Affairs and the Vice President. She has also visited villages to see how Unicef health outreach programmes are helping residents.